Our goal for our baby girl's pink and brown nursery, was to achieve a design that has a modern feel with some vintage touches to add a sense of family. We felt the brown and pink stripes were the perfect complement for our pink and brown baby bedding set that we purchased from Restoration Hardware. My husband spent at least 40 hours or more painting the stripes on the nursery walls alone. We also spent a lot of time brainstorming decorating ideas and putting everything together. First he painted the whole room a base of cream. Then he used a laser-level and painter's tape to outline the 6" stripes on three walls which he painted with the chocolate brown color. Finally he painted the fourth wall (behind Audrey's crib) pink. The crib, dresser & changing topper are from Restoration Hardware Baby & Child's Marlowe Collection and the crib set that inspired our pink and brown nursery ideas and that served as the primary inspiration piece for our baby girl's nursery was the baby girl's pink and brown nursery bedding that we found at Restoration Hardware. 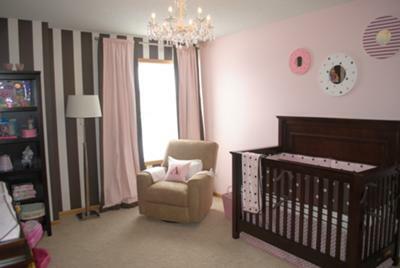 I hope that our daughter's room will help others that stop by Unique Baby Gear Ideas looking for ways to make their project special. This is lovely and I would like to achieve something similar but the paint samples that I've gotten are too pink and not what I am looking for at all. I would appreciate it so much if someone can share the name of a shade of pink that doesn't look like they painted the walls using Pepto Bismol. Time is of the essence since I am due to deliver in just a few weeks.